Faced with the choice of driving to Stone on the M6 or the D road through Stoke, most drivers opted for the M6. However one car chose the D road and suffered a delay. While we were waiting for the last car, some of us took the opportunity to do some warm-up exercises. This is highly recommended and we might do it again sometime. In the 18th century a farm on Downs Bank grew hops for Joule’s Brewery and this continued until the 1940s. John Joule gave the area to the National Trust in 1950, apparently on the grounds that it had originally been common land, and should thus be open again to local people. 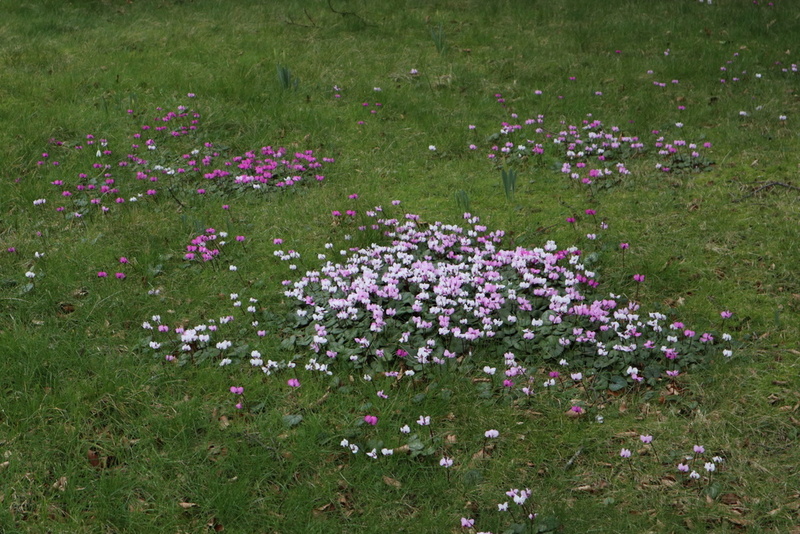 However, grazing by livestock then stopped, causing the characteristic heath flora to decline. The National Trust now arranges for cattle to graze the area in summer to keep the bracken and birch under control and allow natural heath plants to recover. 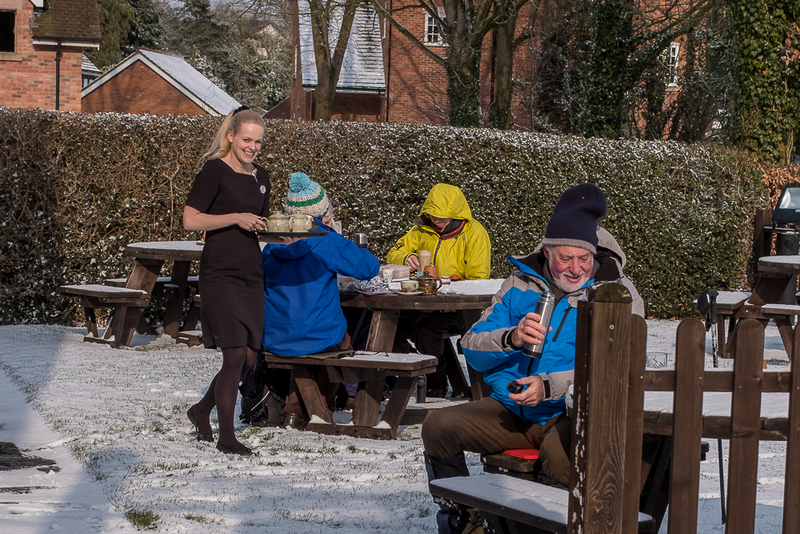 When everyone was in place we left Downs Banks and headed north to Barlaston, where we stopped for coffee in the grounds of the Upper House Hotel. This was built in 1845 for Josiah Wedgwood’s grandson, Francis, and has been converted into a luxury hotel set in 10 acres of woodland and landscaped gardens. 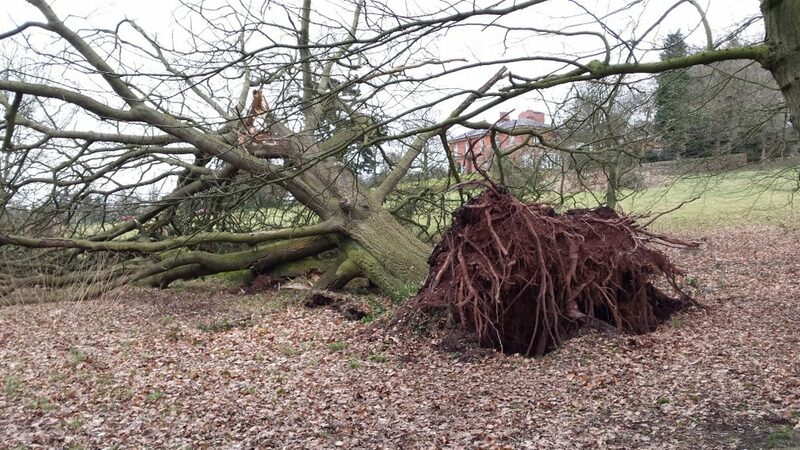 Unfortunately, since we were last there some unintentional landscaping has demolished a massive oak tree. 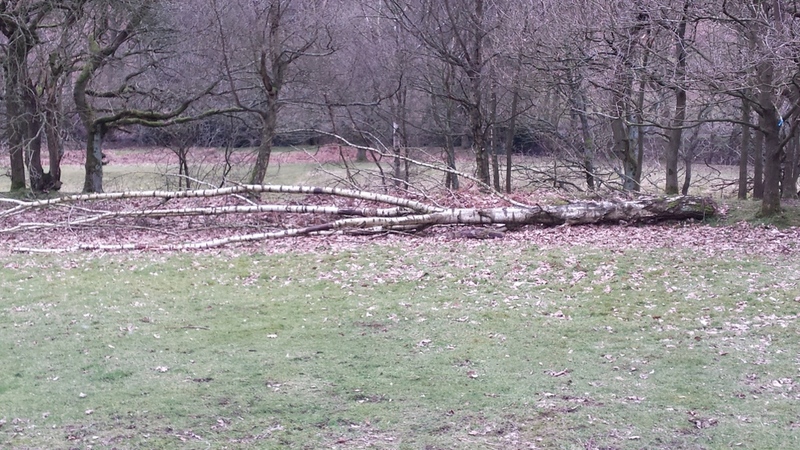 Oak is a proper tree, not like silver birch. 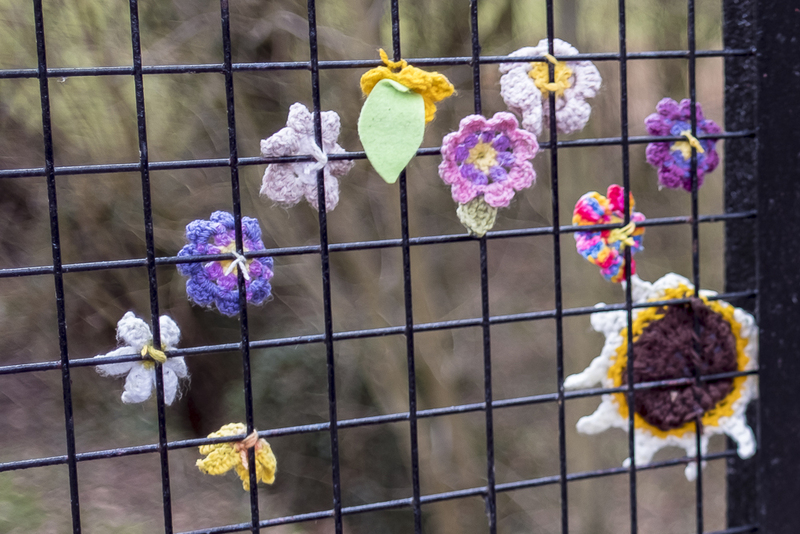 The railway line that passes through Barlaston is very busy, causing frequent closures of the level crossing alongside the remains of Barlaston station. 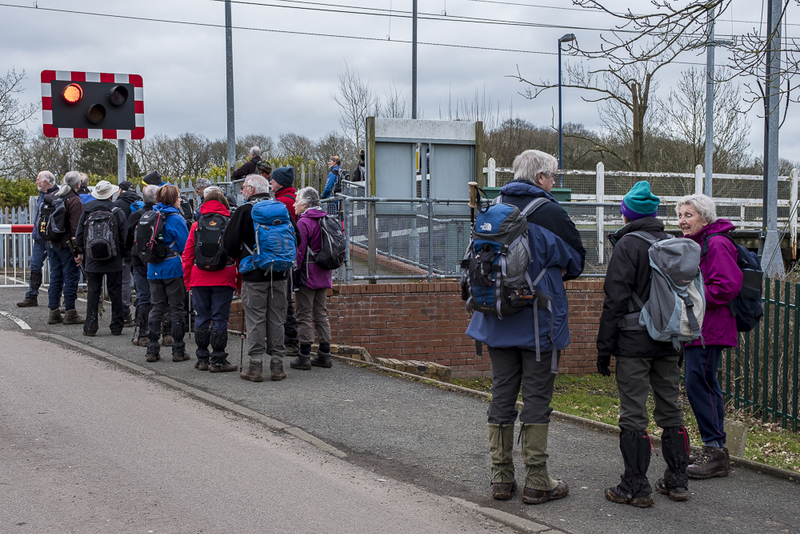 The Badgers, thoughtful as ever, arranged the route so that we didn’t have to wait for the level crossing. Instead we walked half a mile south to walk under the railway and then onto the canal to walk half a mile north. Between the railway and the canal we passed a gas pumping station, where we spent some sniffing the air saying “Can you smell gas?”. Fortunately, no smokers were present. The bridge we crossed to reach the canal towpath featured a hole in the side but nobody was willing to stick a head through it on Ralph’s bridge picture. 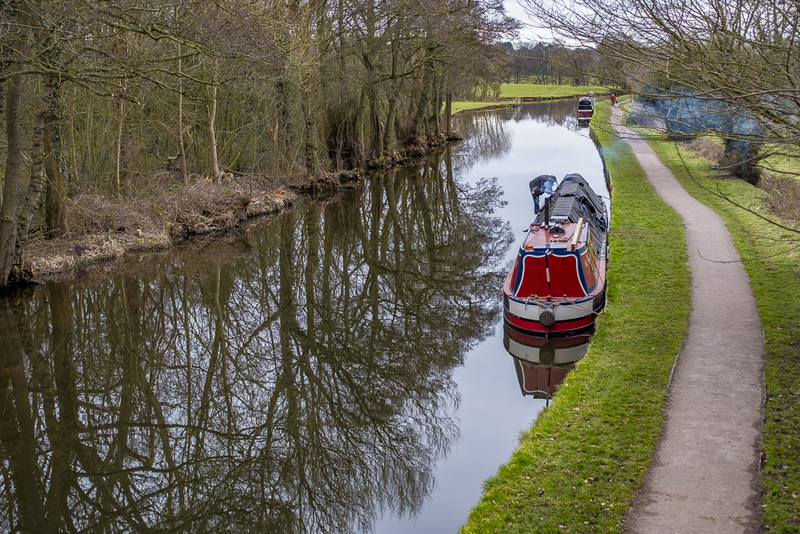 We had a jolly time on the towpath as we passed several friendly cyclists who insisted on dismounting as they passed us. 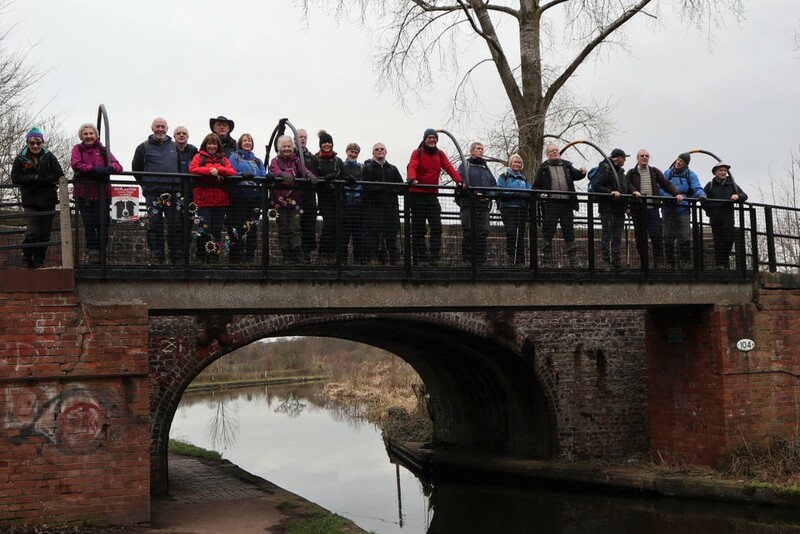 They said it was to avoid knocking us down, but more likely, they feared being hurled in the canal by our large mob. A curious feature of the towpath was the white patches along it. Routine police work revealed that some zealot had sprayed piles of dog mess with a white substance. Whether it makes the stuff rot down faster or just identifies a hazard wasn’t clear, but it does make the piles stand out. We left the canal to seek the Wedgwood Cricket Club, which provided the seating for our lunch. On the way we had to stop at the level crossing for an express train to zoom past. Susie led a group onto the station platform to wave at the driver. Susie loves trains. 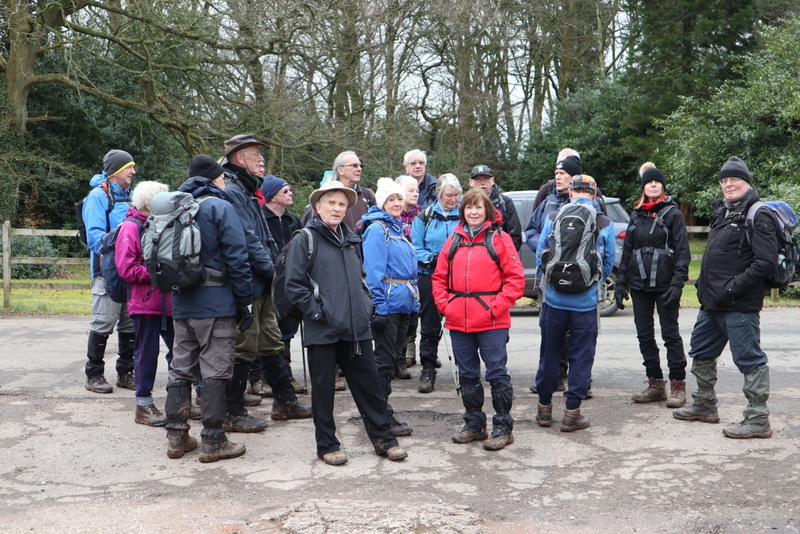 Restored by lunch, we climbed the road to pass Barlaston Hall on the top of a hill and, unfortunately, a geological fault. The hall was built by Staffordshire gentry unconnected to Josiah Wedgwood, whose factory now sits below it. 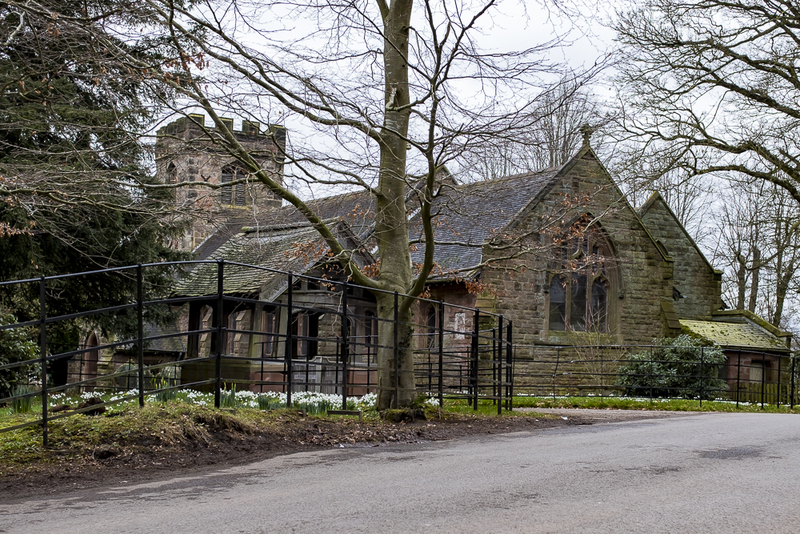 The Wedgwood company bought it as a company college but abandoned it when the geological fault and mining subsidence caused serious damage to its structure. 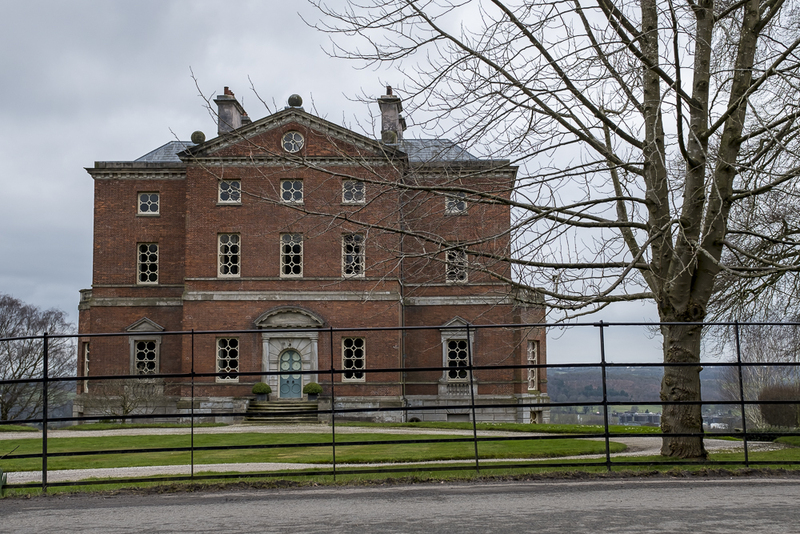 After being restored to a sound condition, it is now a private dwelling available for several million pounds. On the edge of Barlaston we crossed their cricket ground before the journey back to the car park through empty countryside. If you have any questions about Wedgwood or Barlaston cricket grounds, Ian Clarke is your man; he has played them all. 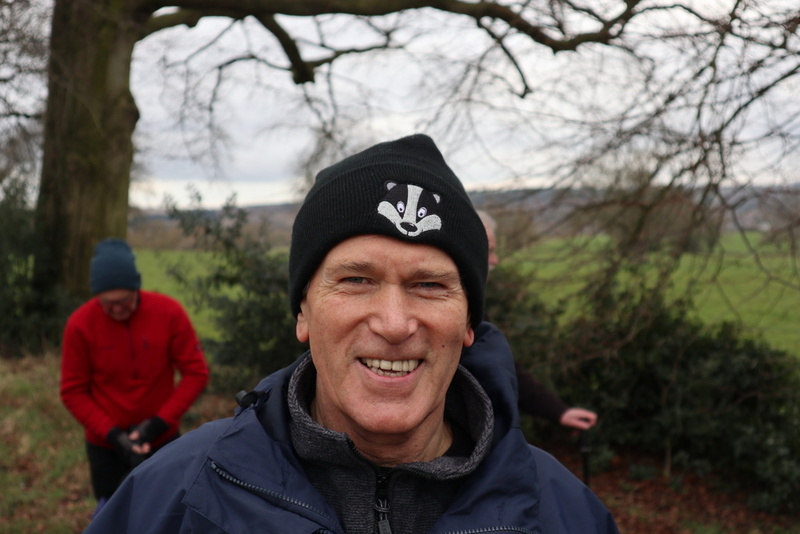 At this point of the walk during the recce, the Badgers found the going very tough across the ploughed fields. The soil was heavy clay (good for making pottery) and to avoid this difficulty, we walked along the lanes instead. 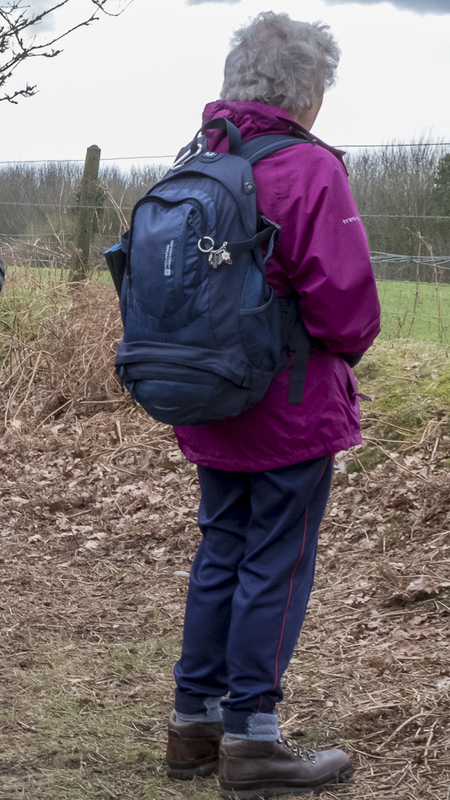 When we returned to the fields, Doreen had a difficult time as she lamented the relative size of her legs and the stile she had to cross. Nonetheless, she deployed the poise and grace she used as a ballet dancer to cross it with aplomb and without soiling her little red walking coat. 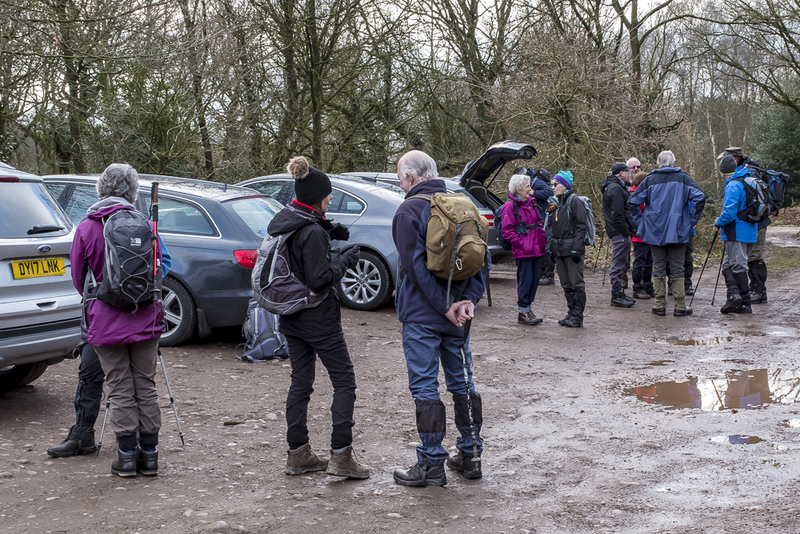 We reached the car park just as the rain started and we were glad to pack away our muddy boots and reflect how useful it was to prefix the walk with the warm-up exercises. Bill supplied some of the pictures below so that fans can see Ralph. There’s a hole in my bridge! Stephen kindly fished this walk out of his pocket to fill an empty slot in the schedule. 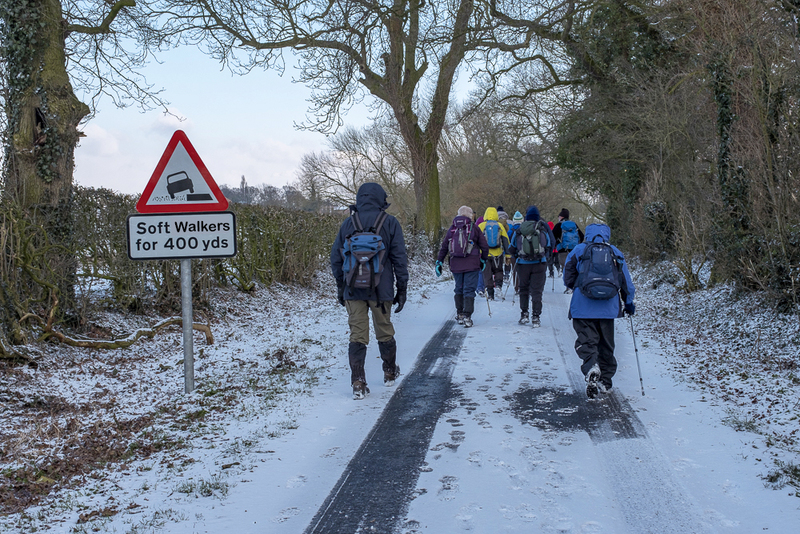 His original plan was to take the bus to Winsford and to walk back from there, but he deemed this plan unsafe because of a very wet section near Winsford. 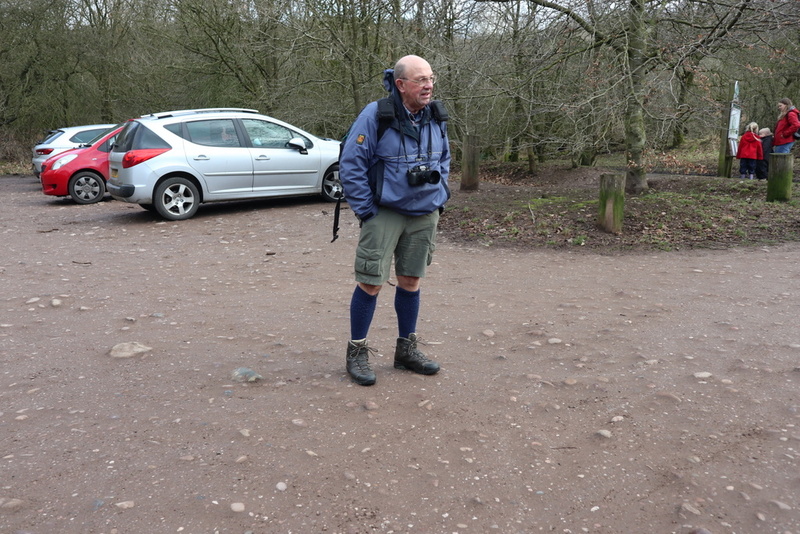 Instead, he chose to walk to the Bears Paw at Warmingham, have lunch on their picnic tables outside and then walk back to Sandbach. 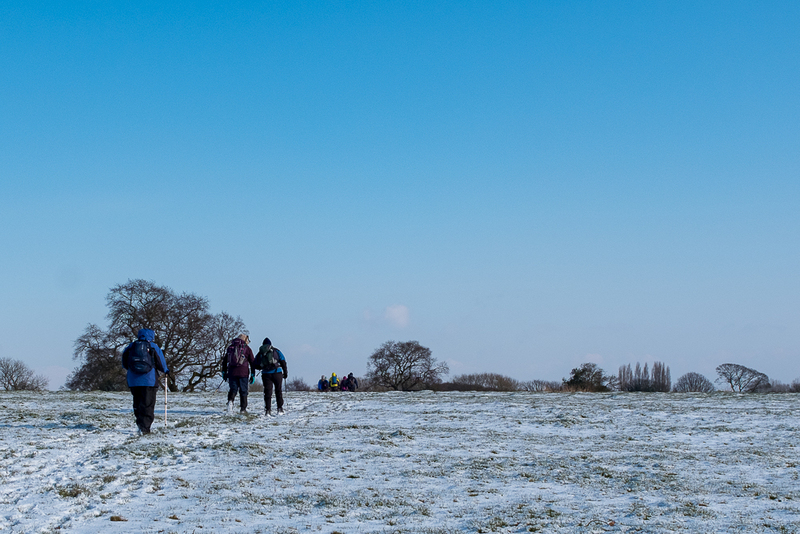 Snow lay on the ground when we set off but the sun kept popping out and it seemed like a good day to walk. 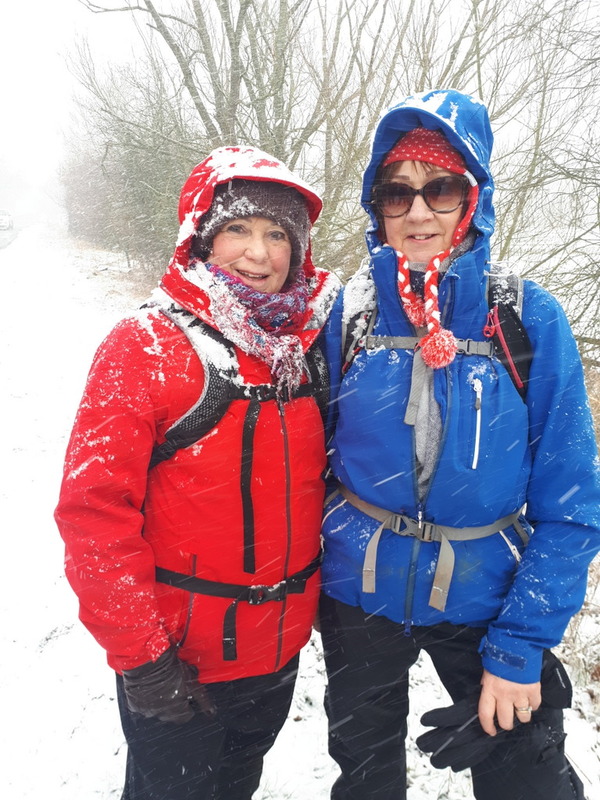 The weather forecasts promised that the “Beast from East” would ship in some more snow in the afternoon but the ground was almost all flat and we were wrapped up against the cold. The “Beast from East” is the name given to the very cold wind driving in from Siberia this week and promising to become even colder. 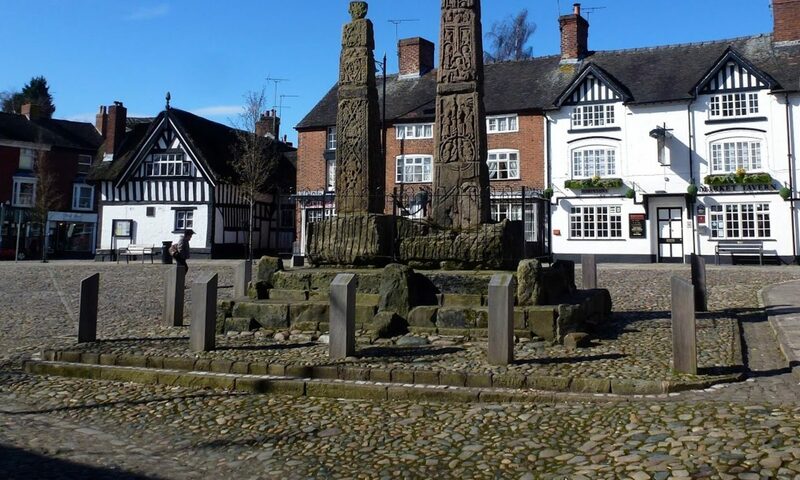 To walk from Sandbach to the Bears Paw, you could choose a short route; a crow with a keen sense of direction would cover only 3 miles flying due west. We didn’t go that way; we went south to the Wheelock Rail Trail. That was where we met the Badgers and added them to our band before we headed east (!) to Malkins Bank. 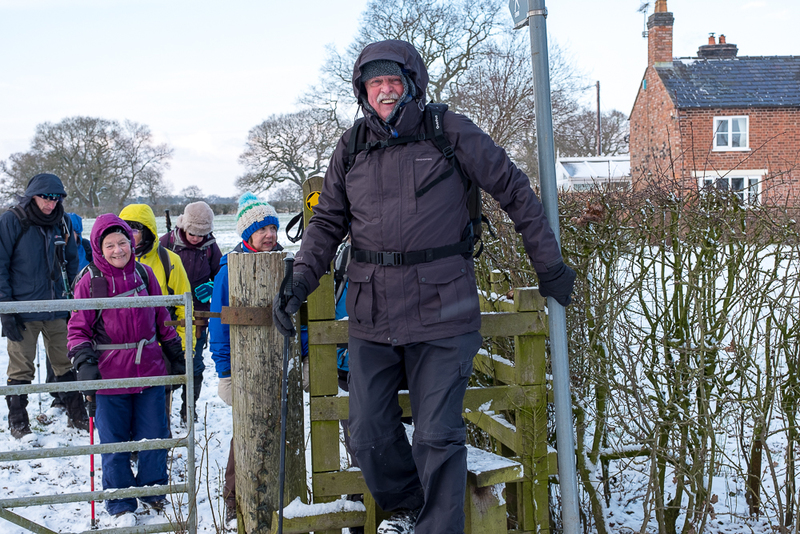 After passing Jubilee Cottages we adopted a more sensible course and aimed for Winterley. 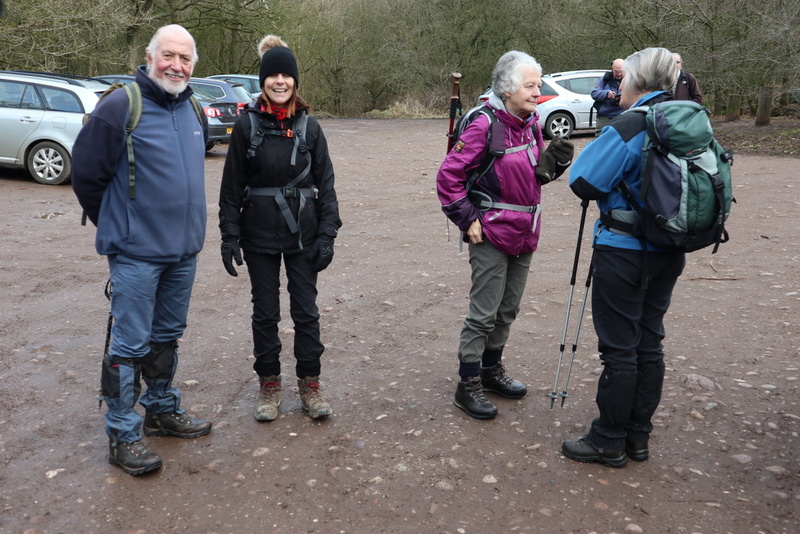 We thought Betty might want to join us but she was committed to going out with Nigel; in fact, they passed our group at Winterley Pool as we had a quick coffee stop. 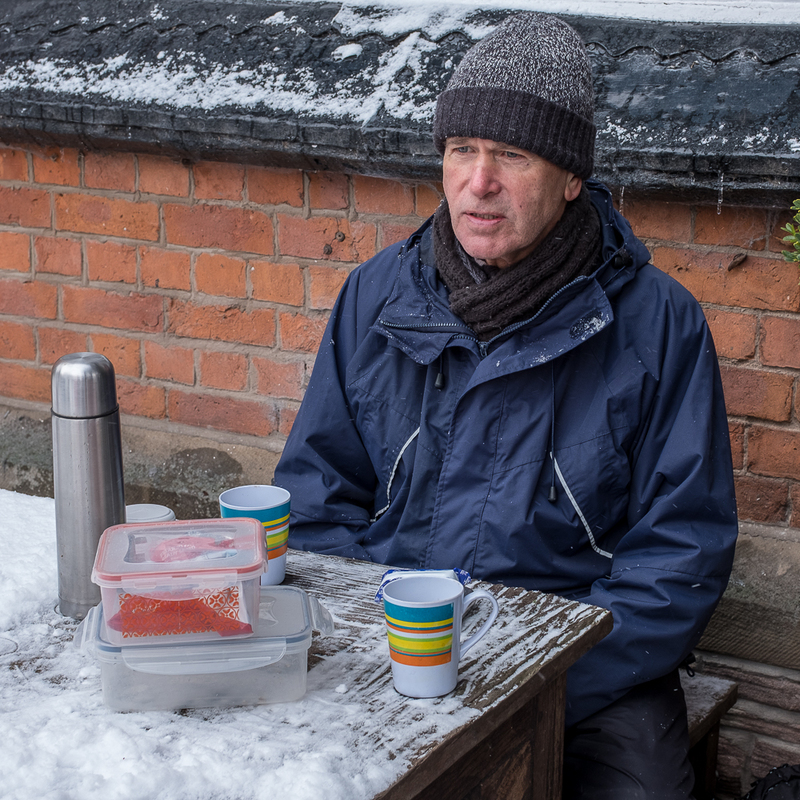 There were two reasons why the coffee stop was a hurried affair; the extreme cold meant we lost valuable body heat while we were stationary and the same cause was putting pressure on bladders. 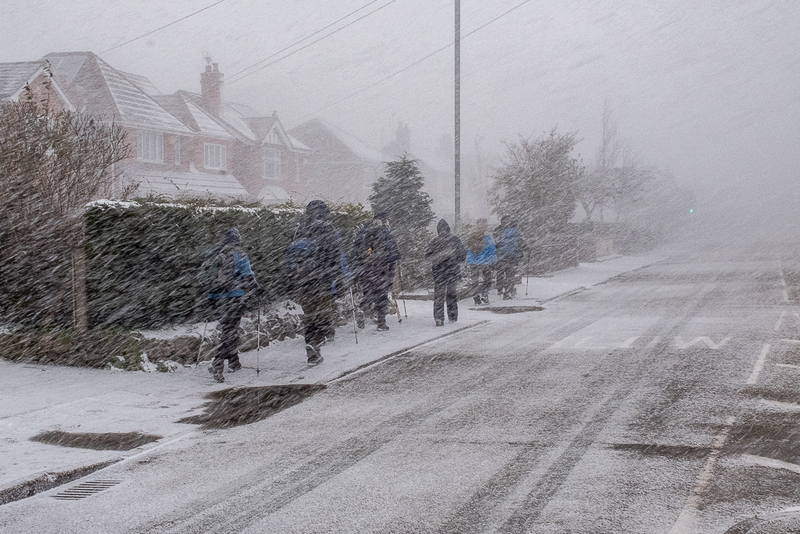 Tom’s house was in spitting distance but he had thoughtlessly left the country and some desperate walkers in the lurch. 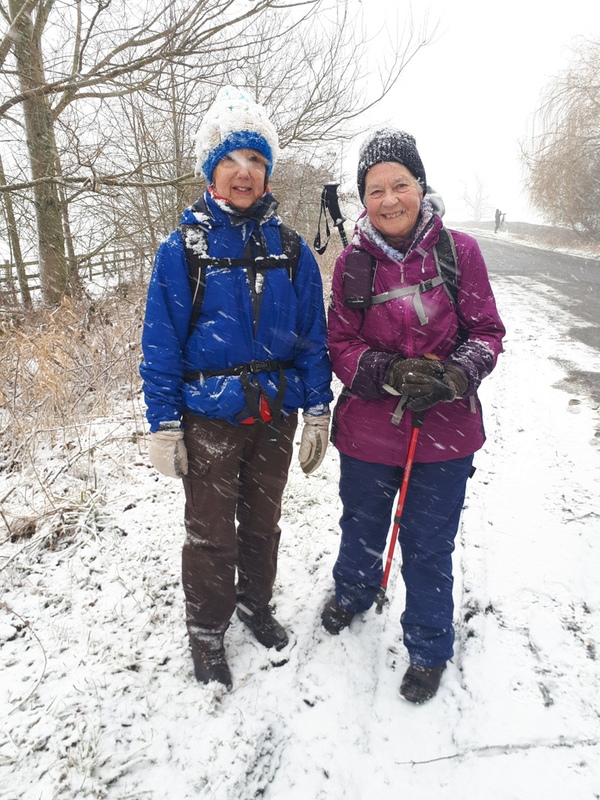 We found some useful bushes on the way to cross the Haslington bypass but the relief we found there was tempered by the arrival of a blizzard. Julie rang Ian to warn that she had just seen a Red weather warning for snow in our area and the fact that we couldn’t see the other side of the field confirmed that the warning was genuine. It wasn’t all bad. Sometimes the sun came out and the fresh snow looked delightful. But sunny or not, it was always cold especially when we stopped at the Bears Paw. 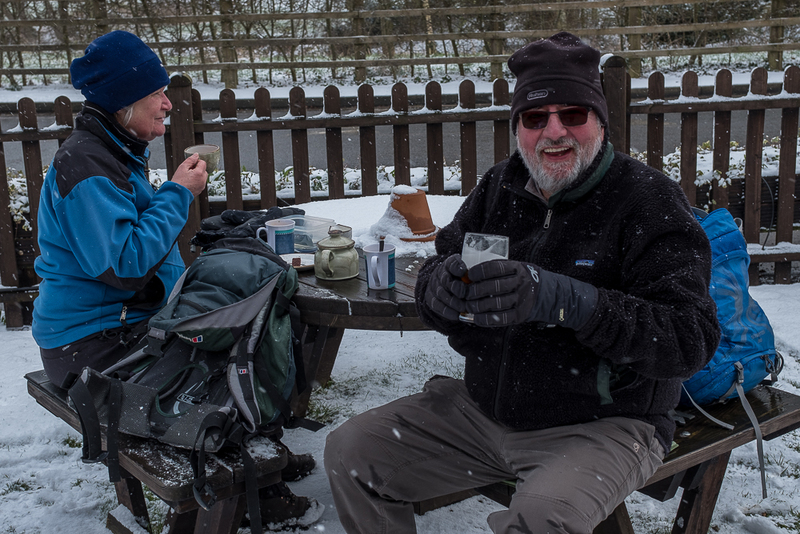 When we stopped to eat, the picnic tables and seats were covered in snow and the wind whipped around us menacingly. It was difficult to eat sandwiches with gloves on and uncomfortable to remove them. 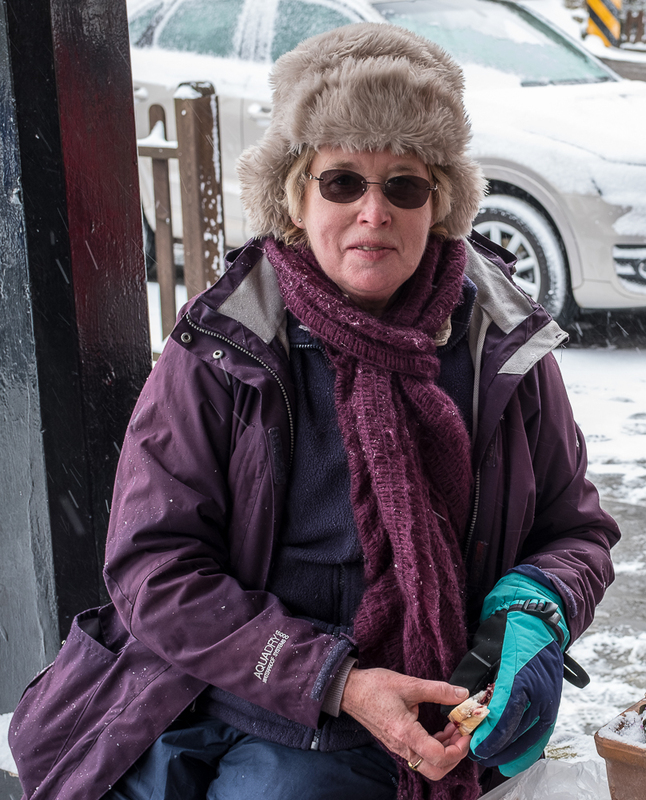 It was a very testing time, and not just for us; the staff who brought hot drinks out to us on a tray were dressed for working in a centrally heated restaurant. They delivered for us a service above and beyond the call of waiting duty. Some of us gave up the wintry picnic meal and went inside. 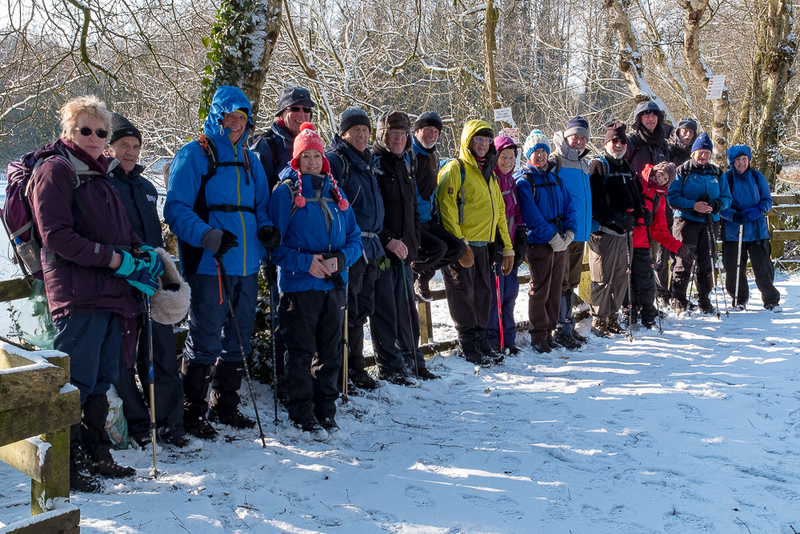 Stephen sat by a big log fire and several walkers joined him for the warmth. It was a good way to bring blood back to the extremities, but it all had to end as we set off for the return journey. The route back to Sandbach was much closer to that taken by our hypothetical crow. With food in our bellies and the sun an irregular companion, we were more relaxed about the journey. The path between Plant Lane and Oakwood Lane is impassable in summer because of the constant bogs and vigorous growth of nettles. 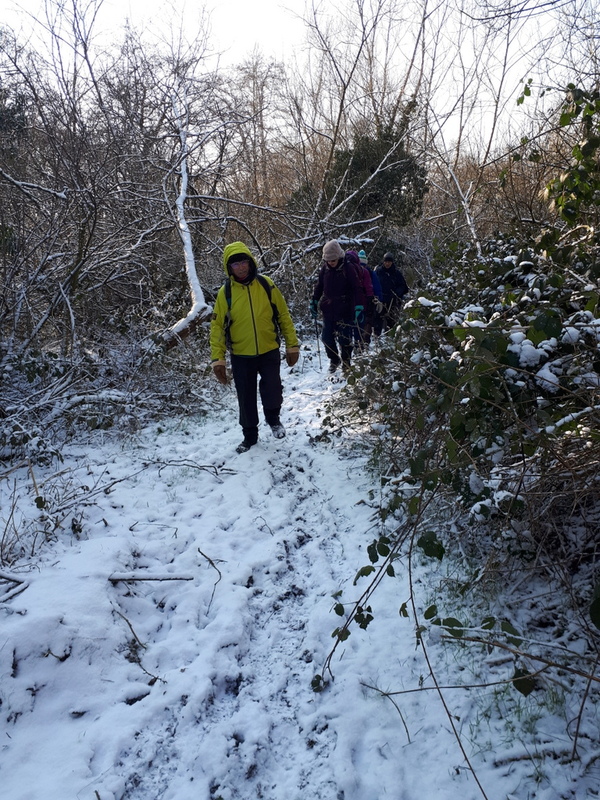 With the ground frozen and the weeds dormant, it should have been easy but there was a section where the bog had resisted the freezing; careful choice of path was necessary to avoid a boot full of mire. 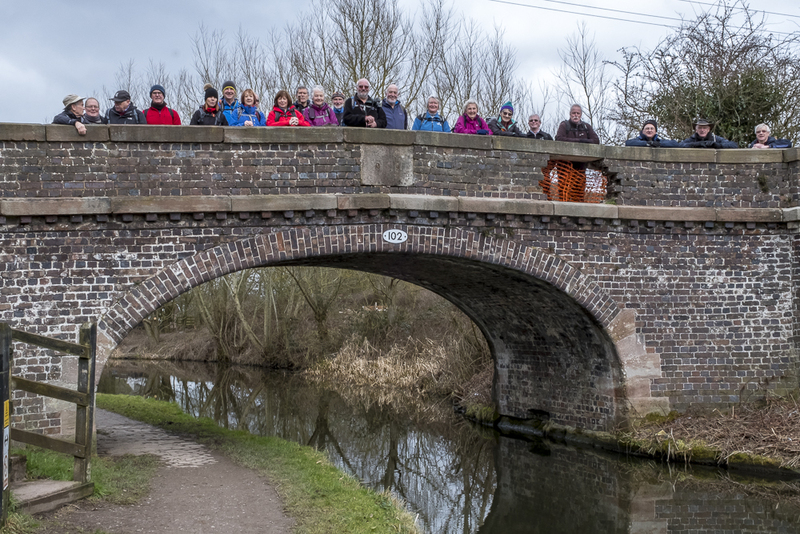 As we neared the canal, Ralph decided that a variation on the usual bridge picture was called for; we formed up on a pretend bridge with a pond behind and Ralph captured the scene. 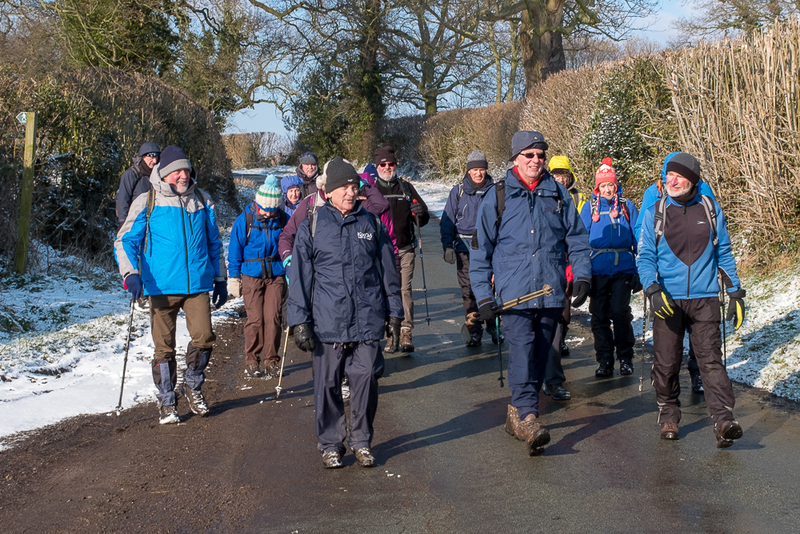 The route along the towpath took us to Ettiley Heath and there the group started to fragment as members selected their own route home. Ten of us took to the Wheelock Rail Trail and it was there that the snow started again in earnest. 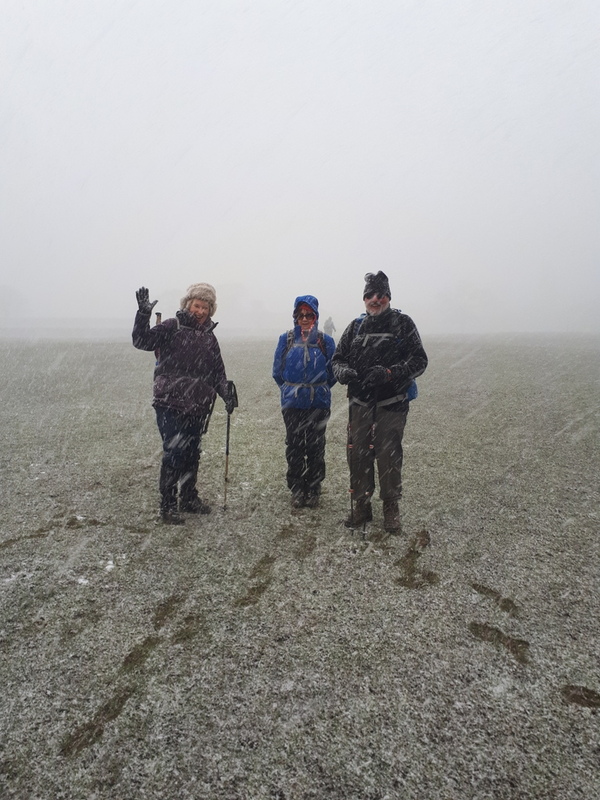 The snow approached whiteout conditions again as we negotiated the final leg of the walk prompting promises of an easy day tomorrow as a reward for the rigours of the challenging conditions on today’s outing. 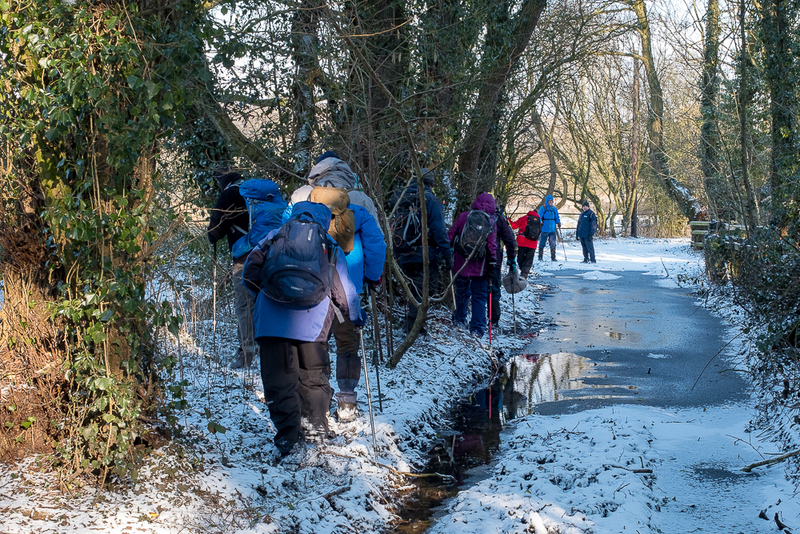 Several members of the group had taken the very sensible step of bringing and wearing grips on the soles of their boots to avoid slipping on the ice. We should all follow their example. The government minister for worrying about old people (there must be one) would surely approve. What did you do in the great blizzard, Grandma? Why did I have to bring the tray out? Ralph has put his pictures from January & February into a musical animated slideshow on YouTube. Click here to revisit what you went through or see what you missed.